Integrate a Nest thermostat into your Vivint system and start enjoying greater comfort, convenience, and cost savings. Adjusts temperature automatically based on advanced occupancy detection. Notifications inform you when the temperature changes automatically. 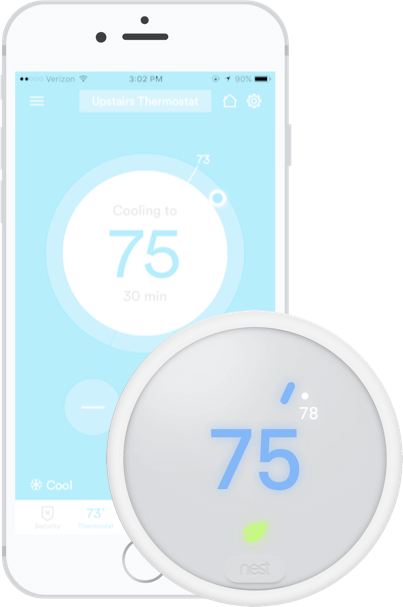 Change the temperature using the panel, the app, your voice, or by turning the outer ring of the thermostat. Frosted display beautifully blends in to your home’s interior. Screen illuminates upon approach, displaying target temperature. Nest Thermostat E uses the sensors and other smart home products in your Vivint system to learn your preferences and set your desired temperature so you don’t have to. And with the ability to sense your presence at home, Nest Thermostat E adjusts temperature to conserve energy while you’re away, saving you money on your monthly utility bill. We’re surrounded by technology, but it doesn’t mean we always want to see it. That’s why the Nest Thermostat E was developed with a subtle design and diffused display screen that blends in seamlessly with your interior. With Nest Thermostat E, the technology that makes life easier stays behind the scenes while you enjoy the convenience and control it brings. Forget traditional thermostats. The Nest Thermostat E as part of your Vivint system offers convenience, control, and comfort that only a smart thermostat can bring. And because Nest Thermostat E integrates with the Vivint Smart Home app, you can control it using your mobile device from anywhere—your living room, the office or your beach vacation. Slim profile complements your home’s interior. High-resolution screen is readable from across the room. With its Farsight feature, Nest Learning Thermostat is always glad to see you. The smart thermostat lights up upon approach, giving you a bright, clear picture of the information you need—weather, temperature, or time. With its big, bold design and high-resolution display you get a sharp view from across the room. 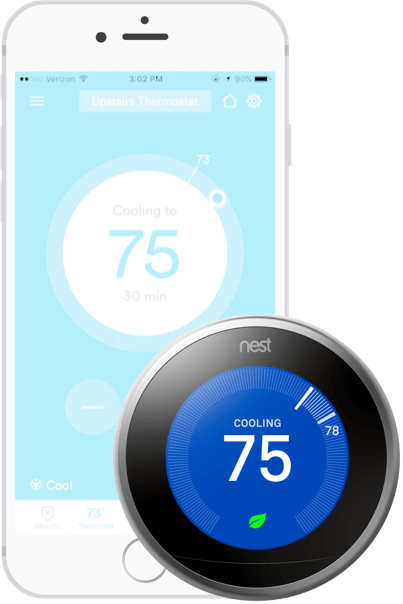 Let Nest update you about any temperature changes with the Vivint Smart Home app on your mobile device. Get alerts and notifications from another room or another state. Wherever you and your mobile device go, your WiFi thermostat tells you exactly what's going on at home. Adding a Nest Thermostat to your smart home system couldn't be easier. Our experienced, licensed Vivint Smart Home Pros will install a Nest Learning Thermostat or Thermostat E in your home, integrate it with your other devices, and help you get it working just like you want it.